One of the ongoing challenges in wearable technology is battery life that’s too short. The key to keeping the battery going may depend as much on current consumed while the device is powered up as it does on the battery’s endurance when it is in standby mode. Your smart watches, earbuds and heart rate monitors draw current all the time, even when idle. This standby current, also called “quiescent” current, can be the biggest cause of the limited battery life of any portable gadget. IoT devices may endure even longer standby times than wearables, having to wake up once in a while to take a measurement and send it to the cloud. The longer you can extend idle mode by lowering the quiescent current consumption, the less often you have to charge the battery or replace it. Keeping your current consumption down by even a few µA can extend charge cycles by months. 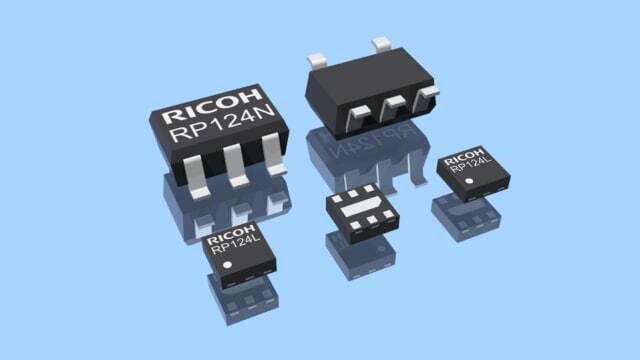 Ricoh’s new quiescent current Low Dropout (LDO) regulator takes us one step closer to longer battery life. The Japanese electronics company’s 100 mA LDO regulator, dubbed the RP124, consumes only 0.3µA (at no-load). The RP124 also includes an integrated battery voltage monitor that helps preserve the battery. At 0.3µA, the current consumption is on the lower end. But the real innovation lies in the voltage monitor. Normally battery charge is measured by way of an external resistor divider + MOSFET connected to an A/D converter. However, monitoring the charge this way causes excess current to be lost to ground. Ricoh gets around this with a built-in high-value resistor divider and voltage follower as a buffer. This way, the input impedance is raised, less current is lost overall, and the LDO regulator can continue to track the battery life. The LDO regulator takes an input voltage of 1.7 to 5.5V and has 11 output versions, ranging from 1.2 to 3.6V. The LDO regulator also has an output enable pin. All of the features are integrated into a single chip with three external capacitors, including one for the battery monitor, allowing plenty of space to be saved on the circuit board.